BNC Str. 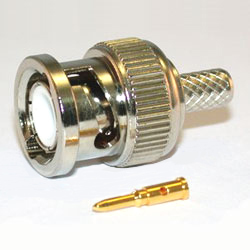 Plug Crimp Type. 1. Suitable cable: (1) RG58. (2) RG174, RG188, RG316. (3) RD316. 2. Impedance: 50/ 75 Ohm. 3. Frequency range: 0~4.0/ 0~1.0 GHz. 4. Working voltage: 500 VRMS Max. 5. Dielectric withstanding voltage: 1500 VRMS 6. VSWR: (1) Straight 1.30 max. (2) Right angle: 1.50 max. 7. Contact resistance: (1) Center contact: 3 milliohm max. (2) Outer contact: 2 milliohm max. 8. Insulator resistance: 5000 Mega ohms min.